Item arrives with a small jewelry bag Condition :100% brand new Material:tungsten carbide Color:Rosegold Weight(kg):0.039 Magnetic jewelry has become a very popular way to treat a myriad of health conditions and problems. Magnetic therapy is the idea that magnets increase circulation, blood flow, and oxygen in a specific area in the body. Increased blood flow can help to relieve pain and stiffness, especially if your joints, back, or muscles are swollen or injured. Many individuals with arthritis and other chronic pain conditions report relief from magnet therapy. Brand Unbranded Metal Tungsten Metal Purity Unknown Style Magnetic Color Gold Main Stone No Stone UPC Does not apply MPN Does not apply. Heavy Biker 9.5 mm Tungsten Carbide Men's Chain Necklace (TUC02)- FREE SHIPPING! 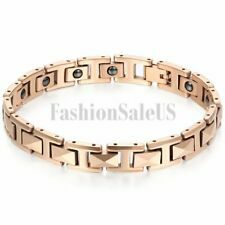 Mens Charm Rose Gold Tone Tungsten Carbide Health Energy Magnetic Bracelet Chain Material:Tungsten Carbide&Magnet Color:Rosegold Size:7.6"（192mm)*0.31"(8mm) Weight:19g . HEAVY 9.5mm BIKER TUNGSTEN CARBIDE MEN'S CHAIN (TUC 002) GOLD - FREE SHIPPING! Beautiful ring with unique design. Built for durability and strength! Feel free to make offers, we accept all reasonable ones! Mens Dog Tag Pendant in Tungsten with Chain. 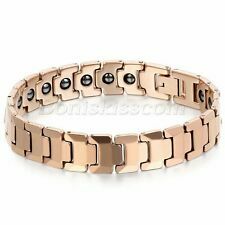 NEW HEAVY BIKER TUNGSTEN CARBIDE MEN'S BRACELET (TUC 001) - FREE SHIPPING ! A very stylish looking men's number necklace. This is a stylish number pendant crafted from tungsten carbide in a squarish shape. The pendant come with a 22 inch box chain. Material : Tungsten. Necklace Type : Necklace with Pendants. ABOUT ICE CARATS. Chain Length : 24 in. Chain Width : 2 mm. ✅ Connect with Jewelry Experts. Product Type : Jewelry. Jewelry Type : Necklaces. Material : Tungsten. Necklace Type : Necklace with Pendants. Chain Length : 22 in. ABOUT ICE CARATS. Chain Width : 2 mm. Length : 22 in. ✅ Connect with Jewelry Experts. Product Type : Jewelry. A very stylish looking men's cross necklace. This stylish cross is made of tungsten carbide in a squarish shape with the cross embeded in the necklace. The pendant come with a 22 inch ball chain. Tungsten Carbide and Tigers Eye Fashion Men's Arrow Pendant Necklace Chain . Condition is Pre-owned with no defects Shipped with USPS First Class Package. Mens Classical Silver Tungsten Carbide Magnet Charm Health Bracelet Bangle Chain Material:Tungsten&Magnet Clasp Style:push-button Color:Silver Size:8.1"(20.5cm)*0.47"(12mm) Weight:54g. Black Tungsten Carbide Men's Powerful Health Magnetic Bracelet Wristband Link Color:Black Clasp Style:Push-button Material: Tungsten Magnet Specification:7.5"(19cm)*0.47"(12mm)) Weight:31g Tungsten Carbide is ranked second hardest next to diamond on the Mohs scale, diamond being a 10 followed by Tungsten Carbide .